In the 90s, author R.L. Stine wrote and published a series of horror books designed for a younger audience, known as Goosebumps. Each story would place a young protagonist in a particularly spooky situation, ranging from evil ventriloquist dummies, psychotic clowns, and other things that certain children would naturally find scary. The books were a huge hit with 90s children, even spawning a reasonably successful television series, while to adults it was a harmless distraction for their kids and not much else. Safe to say, this writer was never one of those 90s kids that was into Goosebumps. They were certainly aware of it, and may have watched the show once or twice, but it was never more than just a memory as opposed to a true childhood classic (even with the show, all that can be remembered is the opening sequence). However, they can certainly respect others who did read it at the same time as them, and if it’s the kind of franchise that can get children nowadays into reading, then we have no quarrel against it. This leads us into director Rob Letterman’s ambitious – for Goosebumps, anyway – adaptation of the series, which seems solely designed for anyone who read it all those years ago, and for children who can’t comprehend the works of Stephen King just yet (King, incidentally, is brought up a few times in the film, in the same manner as Boris Karloff was brought up around Bela Lugosi in Ed Wood; it provides some of the funnier moments of the film). For everyone else, much like how it was originally, it will just go over their heads – but it’s not a complete time-waster either. Story centres around Zach (Dylan Minnette), just your average good-looking teenager who’s just moved into town with his mother (Amy Ryan), who after meeting his next-door neighbour Hannah (young Mila Kunis Odeya Rush) and her reclusive and strict father (Jack Black) discovers a fascinating secret about them; the father is none other than R.L. Stine, and all the monsters that he has ever written are actually real, locked up in several Goosebumps manuscripts where they can cause no harm. Needless to say, they’re soon unleashed thanks to a mistake by Dylan, and he must now team up with Stine, Hannah and his dorky new friend Champ (Ryan Lee) to stop the monsters from causing havoc in the town. The story, developed by Ed Wood writers Scott Alexander and Larry Karaszewski, and then later written by Shrek Forever After writer Darren Lemke, is the best thing about the film. It is one that is ripe for creative possibilities, especially with all the colourful creations that Stine originally created for the books, and also pays tribute to them without being forcibly so (well, not entirely; a few lines of dialogue praising Goosebumps’ ability to legitimately scare children is a tad self-indulgent). It also makes sense to go with this particular story, since it is near impossible to adapt one storyline per movie without incurring the wrath of several fans complaining about their favourite monsters being missed out as a result. Instead, this film does its best to feature all of them; among them the Abominable Snowman, the Lawn Gnomes, the Invisible Boy and, perhaps most famously, Slappy the Evil Ventriloquist Dummy (we say famous, because one little girl in this reviewer’s audience shrieked “Slappy!” when he first appears; that doll must be more recognisable than we thought). Seeing all of these characters and monsters together is bound to make Goosebumps fans squeal with delight – but again, this reviewer isn’t as biased because they weren’t into it as much as everyone else. That being said, however, this reviewer found it to be a fairly decent family film nonetheless; while nothing ground-breaking or immediately innovative like some other films of its type, like Jumanji or Gremlins, it was still a fair bit of fun to see these characters, who weren’t even a part of their childhood, interact with each other and cause havoc in their own quirky way, and the film itself has enough enjoyable sequences that make it a good enough time. The characters, though sometimes bland as can be (aside from Black, who as ever seems to be revelling in playing another enjoyably over-the-top character), are never ungodly annoying and are likable enough to watch; the effects are by no means the best, but they get the job done; and even the turns that it takes in the third act, while silly and even questionable in their own right, don’t ruin the film outright. It is, by all accounts, a completely standard family movie. The one thing we do really hope this movie can do with children, is not necessarily scare them to a point where they can’t get back to sleep (and don’t worry, the film is never truly scary – to adults, at least), but also get them curious enough to go back and start reading the original stories that R.L. Stine wrote, thereby obtaining a potential new generation of fans of the series. While they’re not necessarily the greatest books in the world, as long as this film gets more kids these days into reading then we have no real beef against it. We hope that it does happen as a result of this film’s success, because while Goosebumps is a fairly decent film in its own right, its opportunity to do something greater than itself is far more ambitious. 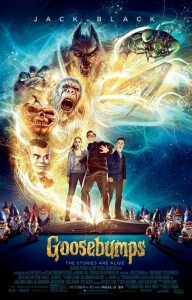 Goosebumps is a completely decent family film designed to introduce a new generation of children to R.L. Stine’s classic book series, while also appealing to those who read them as children during their original publication in the 90s – to the uninitiated, however, it’s still an enjoyable, but far from ground-breaking, film that’s a fine distraction but not much else.